When we had the shop, we did some business with Historex as I felt that it would be good to have a stock of figures. We did get a couple of customers that bought into the idea but it wasn't very popular and eventually we sold off most of the stock to EBay. However, I kept back a few thing that I thought I might like to do. One of these was a Pili Pili Flatz figurine. 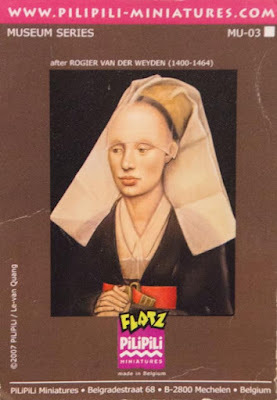 Pili Pili Flatz are resin cast representations of famous paintings.They are produced as a slightly 3D representation of a flat painting. 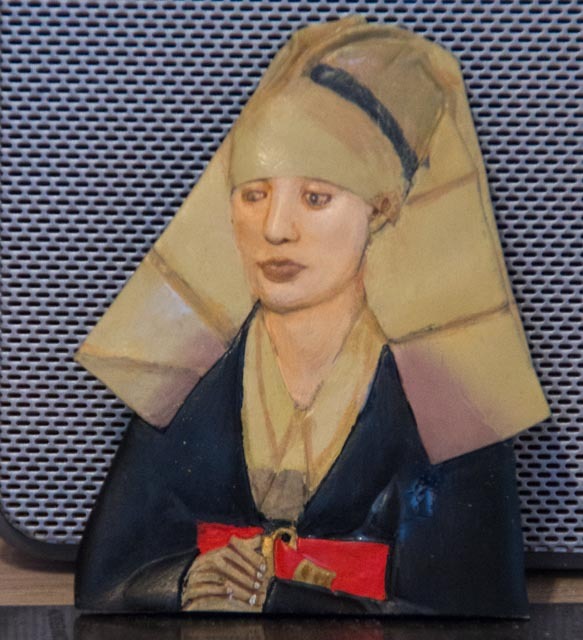 This one is based on the painting by Roger Van Der Weyden (1400 - 1464) that is called "Portrait of a Lady". Here is the box (well packet) art. As you can see, it has some complications. The headdress is semi-transparent so her hair and shoulders can be seen behind the cloth. This is what tempted me towards the item and I felt that this would be a good project for the airbrush. I did it this way but then had to hand adjust the effect anyway. That's a bit too soon to be discussing the final item. I started this model about 5 years ago and got so far but then put it aside when we closed the shop and it then got forgotten. Later, on clearing out my models, etc. I found it again and, miraculously, it still had the box art with it. I pulled it out saying that I would get on with it but never did. Some two and a half years later I have finally decided to complete it. It needed her face to be finished and some final touching up. 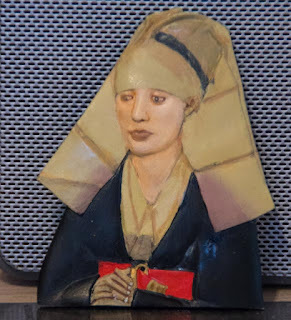 In the event, I over painted almost everything as I found that her hair band was it the wrong place and her fingers weren't painted correctly. It was a fun project but shouldn't have taken quite so long. I was able to finish it because I now have a very nice LED lit magnifying glass which has helped with painting the eyes and the eye surrounds. Firstly, I thought that I would show you what being a "flat" means so here is a side shot of the figure. As you can see, it has very little depth. The item is 83mm high and 60mm wide so it is a reasonable size. Anyway, here is the finished item. It looks better from a distance - grin. It is painted with a combination of Vallejo Model Colour and - for the flesh - LifeColour Flesh Paint set. Great work on the veil as you had mentioned being transparent had created a difficult subject just in that. I think you did a fantastic job. The notion of mimicking transparency seems very difficult to me, but I like the effect. Moving on to pastures old!